Just a quick update - the venue for Saturday's stock-take sale, make and take project, and do-your-own crafting session will at the Edwardstown Baptist Church, corner Rothesay and Dorene St, St Mary's (enter via Dorene St, and turn left). It's not too late to RSVP - please send through as soon as possible though. All other details as below. See you Saturday, at 10am! Stocktake Sale, New Catalogue, and crafting time! Looking for some Christmas card making or scrapbooking inspiration? Need some craft supplies for yourself or as gifts for others? Come along to my New Catalogue Launch with a Christmas Make & Take Project on Saturday 6 December, commencing at 10.30am, for some fun crafting together. We will be making the fun Christmas Bauble cards pictured above, plus door prizes, fun and games. Cost for the session is just $10, which includes a copy of the New Catalogue and a small gift. I will also be having a Christmas Stock-take and Gift Sale, with all current items reduced, plus discontinued products and pre-loved items at very special prices (all prices will be as marked - cash only thank you). I will have a variety of handmade cards and gifts for purchase. Stock-take and Gift Sale starts at 10am (before Make and Take Project commences) so be early to get the best bargains! You are then welcome to join my Craft & Create session from 1.30pm to 4.30pm. BYO lunch/snacks - tea/coffee provided. Bring your own project to work on (or buy a kit on the day), and we can enjoy a crafting afternoon together! RSVP ASAP for Christmas Sale +/or Make & Take Project +/or Craft & Create session, or by 5pm Wednesday 3rd December please, so that I am able to order enough packs for everyone! I will provide venue details on confirmation of your RSVP - the number attending will determine the size of venue required! It's warming up again, and I am watching the weather forecast with interest as I have booked a spot at the Seeds Aberfoyle Uniting Church Car Boot Sale this Saturday, from 9am to 12noon, on Sunnymeade Drive, Aberfoyle Park. The temperature forecast of 33' is OK but it's the north wind that might be a challenge! I will have a range of products for sale (paper packs, card stock, ink pads, embellishments, tools, etc), and all stock for sale at my stand will be discounted, with some items less than half price. I will also have a number of cards for sale, as well as other papercraft goodies. Maybe come and do your Christmas shopping, and find a little something for yourself while you are there!?! And don't forget to pick up a flier about the workshops at Blackwood and Ascot Park, and register your details for a new program to be sent to you in the new year. And for those who attend the Blackwood workshops regularly, next weeks' session will have to be postponed, as I have been advised there will be maintenance work at the church and the hall will not be available - but you are welcome to come along to the workshop at Ascot Park on Friday as we will be doing the same project! Hope to see you on Saturday morning, picking out some bargains! It's been a few weeks since I posted, so hope you have all been busy crafting in the interim. Our New Products Inspiration Day was so much fun - be sure to join us next time if you can! And a special thanks to Joy and Karen for helping on the day. I have updated the Ascot Park workshop program - plenty of space in a lovely facility, so come along and bring a friend too! I have received a few requests to run workshops in the evening, so I am currently thinking about holding a once a month evening session, offering both a scrapbook or card making project ie you get to choose your type of project. If this would interest you, please send me a little note, and I will try to offer the session at a time that suits most. This fantastic Spring weather is such a lovely end to a cold and grey winter. 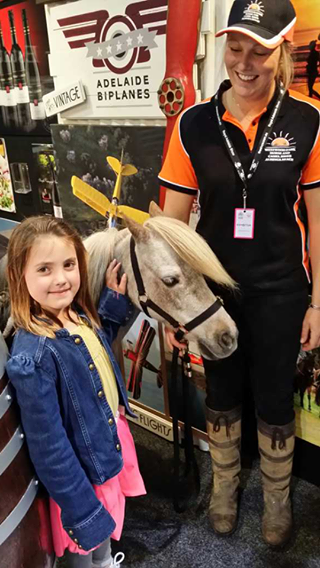 I am hoping it continues for the next couple of weeks, so that you can come and visit me at the Royal Adelaide Show! I am very fortunate to be one of the businesses in the City of Onkaparinga Showcase. The stand will be in the Jubilee Pavilion, and includes 12 other businesses who operate in the Onkaparinga area - a region that is great to run a business, and a region that has such a wide array of local businesses which you can support when you "Buy Local"! Just a reminder that I have a new program starting at Ascot Park (not too far from Edwardstown or Park Holme). There are a few seats available for this Friday morning, so please contact me ASAP to book your place! I am very excited to announce a new program at a new location! Please book your place to join me at Ascot Community Church, Friday mornings, from 10am, every fortnight commencing 8 August. To see the new program, just click here. Can't wait to get started at the new venue - looking forward to seeing you there! Well after cancelling all classes in June, I am very pleased to release a new program for Blackwood Workshops for July - September! Yay! Additional workshops are also in the pipeline, as well as catch up classes for sessions that were postponed in June. Please note, that as of 1 July 2014, a 50% deposit is required when booking into a 2 Hour or Master Class Workshop. Feel free to have a chat with me about the payment method that suits you best. Please let me know if there's something special you would like to learn, and I may be able to include it in the next program of workshops! Unfortunately I have had to reschedule all workshops for June, but a new program will be released soon - watch this space! Oh dear - this week has to be cancelled as well (week ending 13 June). I will post a new program, for July onward, when available. Unfortunately I have to postpone all classes scheduled for this week due to ill health. I will try to reschedule additional make-up classes as available. My sincere apologies for the inconvenience. Here's hoping all is well for next week! Quick note to let you know my Coffee and Card Class, scheduled for tonight, has been postponed. I will advise another date ASAP. Sorry for the inconvenience. Had a lovely time at the Adelaide Velo City official welcome reception last night. The city will be a buzz with people from all over the globe talking about cycling and cyclists for the next week. If you are one of the international visitors, I hope you enjoy your stay in Adelaide! Why was I at a cycling conference reception? Because I am hosting a series of paper craft workshops featuring bicycles, as part of the Velo Fringe! It's been great fun so far, and there is still time for you to join in - on Friday afternoon from 4.30pm at Charlie's Place Coffee Lounge, in the Adelaide Central Market Plaza. You must contact me to book your place though, so I can prepare the right number of card making packs for everyone. It would be great to see you there. And it's not too late to book in to the Kaszazz New Product Inspiration Day - coming up this Saturday 31st May. There will be special offers on the day if you book a party or if you wish to join up as a consultant! Woo hoo! It's an all day event, with a free Make and Take, and a $25 card making workshop, but if you can only attend in the morning, or just the afternoon, that's OK, but please contact me by 5pm this Thursday to confirm your place. Book your place for New Product Intro Day! Wow! The new Kaszazz products released over the weekend are just lovely! Gorgeous new scrap book papers, stamps, inks and embellishments - crafters heaven! If you'd like to join in a FREE make and take session, and to try some of the new products, please let me know and I will book you into our morning session on Saturday 31st May. If you'd like to stay on in the afternoon, there will be a 2 hour $25 card making workshop - also featuring the new products. If you can't attend, don't worry - just contact me to book your own Demonstration, and then you will also be eligible for the fantastic Host benefits and bonuses! And don't forget to book you place at any of the events celebrating the Adelaide Velo Fringe. Come and try something new (and no, you don't need to be able to ride a bike to participate!). See tab above for more details. See you soon! To celebrate the May 2014 release of new products added to the Kaszazz range, there is a special event being held and you are invited! Write in your diary now that you are coming on Saturday 31st May! There will be a FREE Make and Take Demo, 2 hour $25 workshop and a shared lunch. FREE Draws and New Product Display. Please BYO a small plate of lunch to share. Come along and enjoy a day of Creative Inspiration and Fun. Bring a Friend who is new to the Kaszazz Creative Club and you and your friend will both receive a "spend $50 choose $50" voucher. Bookings essential but seats are limited - RSVP by no later than Saturday 24th May. Contact me to book your seat, and to obtain location details, etc. Yay! The Adelaide Velo Fringe program is being released tomorrow! The Velo Fringe celebrates all things related to cycling, so grab a program or check the website for a full list of programs - and no, you don't need to be able to ride a bike to participate! I will be hosting a new twilight class, at Charlie's Place Coffee Lounge, located in the Central Market Plaza. For just $10, you will make a card, and receive a voucher to enjoy a delicious coffee afterwards. The first session is on Friday 9th, with a Mothers Day theme card. During the Velo Fringe, all the cards will have a cycling theme, but suitable for anyone! Bookings and prepayment are essential for these sessions. Be sure to check the program details (above) for other locations of my scrapbooking and card making workshops. Looking forward to crafting with you soon! The workshop program for Blackwood has now been released. Please be sure to contact me to book your place - I need time to order materials and prepare a workshop kit just for you! Hope you enjoy the projects in the new program. Wow! We had such a fantastic time at the Enfield Flower Festival over the weekend. And it was exciting to introduce Kaszazz to so many people. Can't wait for the Mega Demo on May 10th to show them more, and to see what lovely cards they will all make. If you are coming along, don't forget to RSVP by Friday 2nd May. Thank you. A new workshop program for Edwardstown is now available. We are also planning to run some Kaszazz workshops at or near Enfield. Watch this space for more details! I am counting down to our fantastic Mega Demo this Thursday night. A few places are still available, but be quick to book your spot! I am counting down to seeing so many people at the fabulous Enfield Festival of Flowers this weekend, open from 10am to 4pm, at the Enfield Community Centre. Enter our FREE Kaszazz raffle, and book into the next Mega Demo, to be held on Saturday 10th May at Enfield - full details available at the Flower Festival stall. Also, if you are attending the ABC 891's Adelaide Gardener's Market, be sure to travel 5 mins up the road and say Hello! I am counting the number of days until the next Kaszazz new product release - the weekend of May 17 & 18th. I'm thinking I will need to have a stock take sale to make way for more lovely products. And I'm also looking forward to counting the number of new customers who come along to a new workshop at Blackwood, Edwardstown, Semaphore, or Enfield! I am very excited to announce some new activities for you to enjoy! I will be at Pasadena Green Shopping Centre this week, as part of a Kaszazz stand in the shopping centre mall area. Please come and say hello, enter the free competition, and sign up for the Mega Demo to be held on April 10th. I would love for you to be part of my group, so be sure to put my name on the bottom of your Mega Demo form. I am starting regular workshops at the Edwardstown Baptist Church, on the 1st and 3rd Fridays of the month, from 10am-12pm. The first session is on Friday 4th April. Registrations are essential. I will post a program as soon as possible, but in the interim you can contact me with your details and I can send a program to you directly. And don't forget to come and visit my stand at the Enfield Flower Festival, at the Enfield Community Centre, on April Saturday 12th & Sunday 13th. You can enter (another!) free competition, receive a free gift if you are one of the first 40 people to come and say Hello, and sign up for a Mega Demo. I am also taking registrations of interest for regular workshops in the Enfield area, so be sure to add your name to the list if this is a convenient location for you! And finally, time is running out for Kaszazz orders to be received and processed by COB Tuesday 18th March, so that you can choose from either a Kaszazz gift voucher worth $20, OR an Ezy-Press Die (selected at random by Kaszazz), for FREE. Minimum order for this promotion is $100RRP. Send through your order by 4.30pm 18/3/14, and I will process your order (FREEbie promotion excludes redeemed vouchers). So much happening - and so exciting to be able to invite you to be part of it too! Looking forward to crafting with you soon. I'm very excited to have received an invitation to have a stall the Enfield Festival of Flowers - combining two of my favourite things - papercraft and gardening! So make a note in your diary to keep April 12-13th free, and come and visit me at my Kaszazz stand between 10am and 4pm at the Enfield Community Centre, 540 Regency Road, Enfield. There will also be a sausage sizzle, devonshire teas, and a fantastic range of plants on display and for sale! I am taking registrations of interest for people interested in doing card making and scrapbook workshops at Edwardstown. Please send through your details if you would like to receive a workshop program - to be finalised ASAP! The West Lakes Workshops have a new home! We will now be meeting at the Bower Cottages Community Centre, Semaphore, with the workshop commencing at 1.15pm, and finishing at 3.30pm. Click here for a map. Don't forget to contact me to book your place. See you on Friday 14th! Just a quick reminder to check the expiry date of your Kaszazz vouchers - if they expire at the end of this month, you only have a few days left to use them! If you are not sure what to buy, you can always buy an extra voucher! Please contact me before 12pm this Friday (January 31st) with your order including your voucher code, and I process it straight away. Click here to see the new products and projects flier! Then, send me a message to book a workshop or a FREE demonstration. Next week sees the start of the TDU 2014 here in Adelaide. It's currently 45` in the shade, so I hope it cools down by the time they have to start!!! Hard to believe just a few months ago I was in Annecy, France, cheering on the start (yes, standing right next to the start gate) of the penultimate stage of the 100th Tour de France! Just fantastic...ahhhhh! I am preparing some 'cycling' themed workshops, as Adelaide is hosting the International Cycling Conference, in May this year. As part of the program, there will be a Festival, known as the Velo-Fringe, for all things cycling to be celebrated. So I decided that papercraft should be included as well. Feel free to send me an email with your contact details, and I will send you a copy of the program when it's released. Safe cycling, and happy crafting! New workshops starting at West Lakes this week, plus program for Blackwood (commencing February) also now available. But wait, there's more! Kaszazz birthday celebrations have begun - select a new celebration stamp available free with every $70 ordered. Check the Something Special tab above!